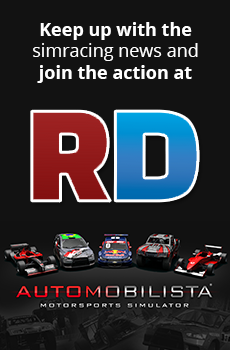 Discussion in 'Automobilista - Links & Resources' started by Frederic, Jan 5, 2017. Thanks, that did the trick ! Link was listed in this DRM event to be used now on Sunday 4/3-18! Any idea where this version stands as far as AMS features go? It seems 1.1 had a consistent FFB (no need for reversing FFB main value). Any idea where this version stands as far as AMS features go? No idea, maybe it's an "all in a package", I just extracted all the files to my AMS folder and copied the realfeel and it was ready to go with an icon and championship available. If the 1.1 was the version found at RD that one seems to need some hands on to work correct. Well, I re-installed the newer version (I had so much issues with FFB of this mod before - don't recall which version I had) and it works great now. FFB is good, no need to reverse (which made it still feel wrong). Not sure there is a problem with the community or AMS per se. You have to remember that we're living some kind of golden ago of racesims. We've never had so many available sims around at the same time. The global racesim community is not made of millions and AMS is a niche product. The modding community is even smaller. Clearly AC is getting the lion's share of the modding community. More often than not, mods get attention thanks to their looks and AC provides the best platform for that. I think that we should be grateful that AMS gets several top quality mods like CART Extreme, Porsche RSR'74, Sirocco Cup and a couple others. This is top quality mod content with no need of sound fixes here, FFB special parameters there, etc. AMS is a small platform which provides us with a few BUT top quality mods. I feel quite OK with what we have here. Reiza's not Kunos and I don't think they've sold 100's of thousands of AMS copies (which is totally a shame according to me). A shame you cannot release those mods. I think DRM is a must. I also love the BPR/GT400/GT600 era. Plenty of cool cars. In my opinion it is the community's problem, I mentioned the mods because it was an example. I am also delighted with the quality mods, cars as tracks and grateful for the information that the team contributes to the studies and modder was not my intention less value your work. Where can I find version 1.3?